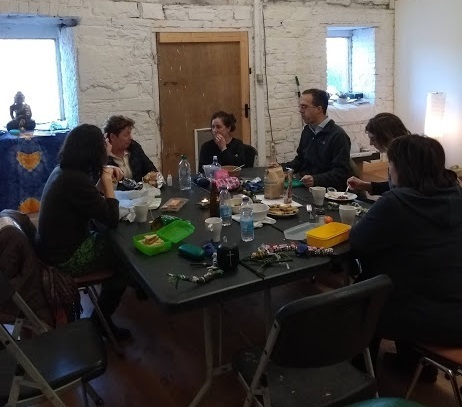 We gathered in the morning at Bective Mill where our host, Jean, had prepared the space for a wonderful celebration which included meditation, healing, singing and dancing, meaningful arts and craft activities, feasting, laughing and more. As seen in the photographs, Jean had a doorway made which referred to Brigid who was said to have been born in the thresh-hold of her family home – symbolising how she was of this world as well as the Divine realm. 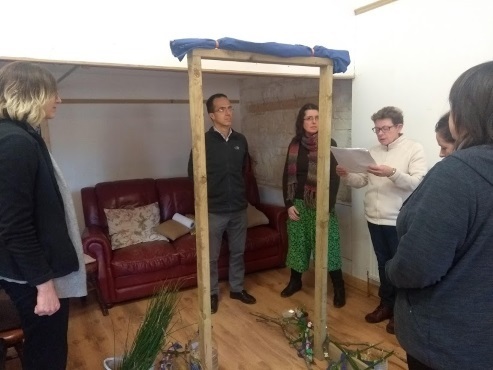 Each person passed through this doorway to be welcomed by other members of the group and the cloak which adorned the frame was unfurled and held by all as some beautuful music inspired by Brigid was played. The cloak had of course been left out overnight as is tradition at this time. 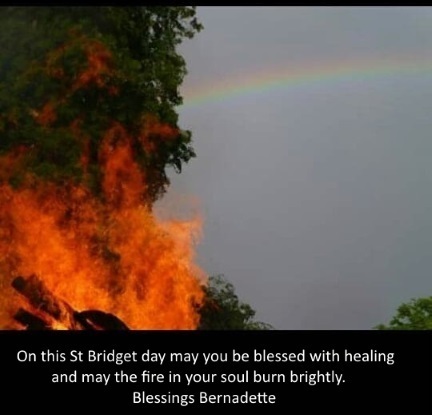 Legend has it that Brigid passes over the land on the eve of her feast day and any cloths - “Brat” - left out will be imbued with healing properties for the coming year. Jean then led us in some dancing before we settled down for a wonderful meditation. 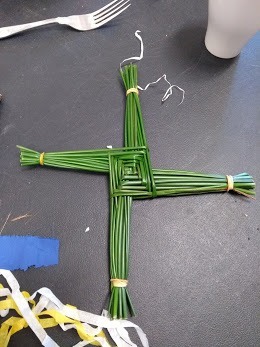 After some healing and much-needed grounding, we adjourned to the “craft tables” where we proceeded to make Brigid's crosses and decorate sticks in whatever way took our fancy. 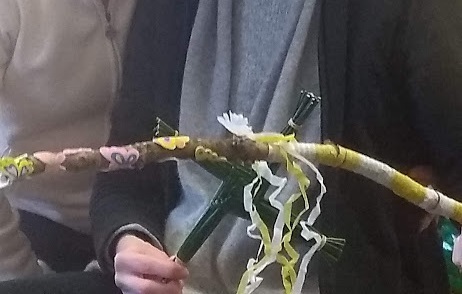 This wasn’t just a craft exercise however as we held our intentions for the coming year as we worked – thus the sticks represent the seeds of ideas that we hope to harvest before the end of the year. As usual the chat and banter was super and we all learned from each other – especially our visitor and new friend from New Orleans, Camille! 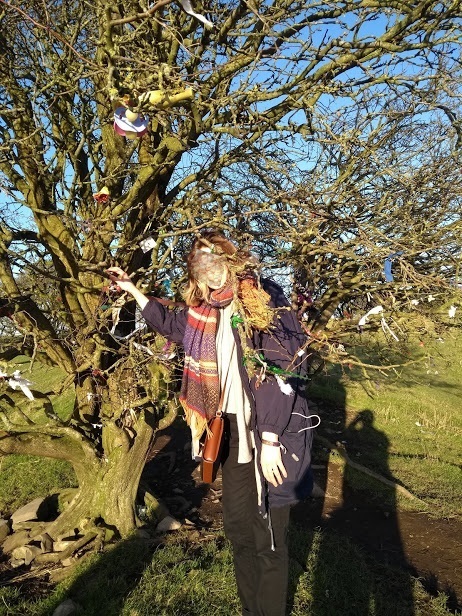 There was a great sense of Spring, Renewal and Feminine Energy throughout the day and as Brigid blessed us with fine weather, some of us went to the Hill of Tara afterwards. We paid particular attention to the Mound of the Hostages as it's entrance is aligned to the rising sun at this time of the year. Having worked up a nice hunger by then a few went for dinner in a local eatery to finish off the day's proceedings. A wonderful time was had by all and thanks to Jean for all her hard work. As well as our crafty handiwork, we each brought home positive intentions for the coming year and a sense of community which Jean had worked so hard to foster. Until the next Celebration, Slan agus Beannacht. 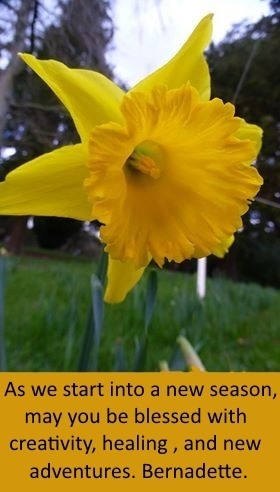 The following are in the Other Notable Dates and Festivals section which is contributed by Anne. 3rd February - Feast of St Blaise.